Test Mailer enables you to quickly send an email and monitor or debug all communication with the recipient mail server. There is no need for a smtp server, Test Mailer will act as a mail server itself and lookup the MX records for the recipient. 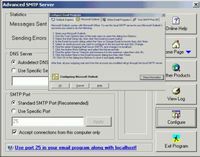 Use the advanced options to create special circumstances and save the communication log to inform postmasters about any configuration problems in their email or mail server setup. Typical use: - An email message is rejected by a mail server, review the complete communication. - A message does not arrive at it's destination, verify the mx records for the domain and mail servers involved in the delivery process. - Send a quick test message to verify if your mail server act's as an open relay server. - Verify the authentication and methods for authentication with a mail server. - Lookup mx records for a domain and verify if the fall back mx records and mail servers are working as they should. - Debug any spam or virus filters that might reject a message in special circumstances. Key features: - Automatic lookup for MX records. - Automatic reference numbering for each test message. - MRU list for frequently used email addresses. - Save communication reports. System requirements: Windows 98 or better.